Author, journalist and women's rights campaigner. Founder of human rights in childbirth charity Birthrights and sometime doula. Out 3 May, published by Penguin Life. This book is wonderful - beautifully written, warm and full of compassion and wisdom. I can't think of a panicky question I had thought of through either of my pregnancies (and I thought of them at a rate of five per second) that wouldn't have been answered by this book. I wish I had had it, in fact. A very empowering guide to becoming a mother. I loved it. 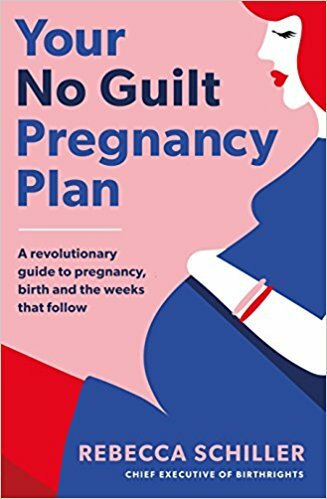 (Robyn Wilder The Pool)"
Your No Guilt Pregnancy Plan is a revolutionary new guide to pregnancy and childbirth that puts the power firmly in your hands. It won't tell you what fruit your baby resembles week-by-week, but it will cover the huge shifts happening in your relationships, body, work and emotional life right now, giving you practical tools, tips and real stories to help you make a plan that is uniquely yours yet flexible enough to accommodate whatever your pregnancy, birth and life throw at you. With so many decisions to make and so much conflicting advice from the internet, friends, healthcare professionals and in-laws, it's easy to feel overwhelmed during pregnancy. Throughout her career as CEO of Birthrights, the charity that promotes women's rights in childbirth, parenting journalist, and one of the UK's best known doulas, Rebecca Schiller has supported countless women through pregnancy, helping them to find the solutions that are right for them and their families. And she has discovered that whilst a stress-free pregnancy might not always be possible, a guilt-free one certainly is. Packed full of unbiased information, helpful illustrations and a firm focus on your mental health and wellbeing, this is the definitive no-judgement companion to your pregnancy and birth, laying out all your options at every stage - from conception, to maternity leave and coping with labour, right through to your first weeks at home with your newborn. Full of Rebecca's characteristic warmth, reassurance and expertise, this book covers the topics that really matter in your life, equipping you with the knowledge and confidence to be your own expert, take care of yourself, know when to ask for help and have your baby your way.